The defending champion Cavaliers improved to 5-2 on the season May 5 with a 25-17, 25-16, 29-27 sweep of the Grizzlies on Friday in Hollis. 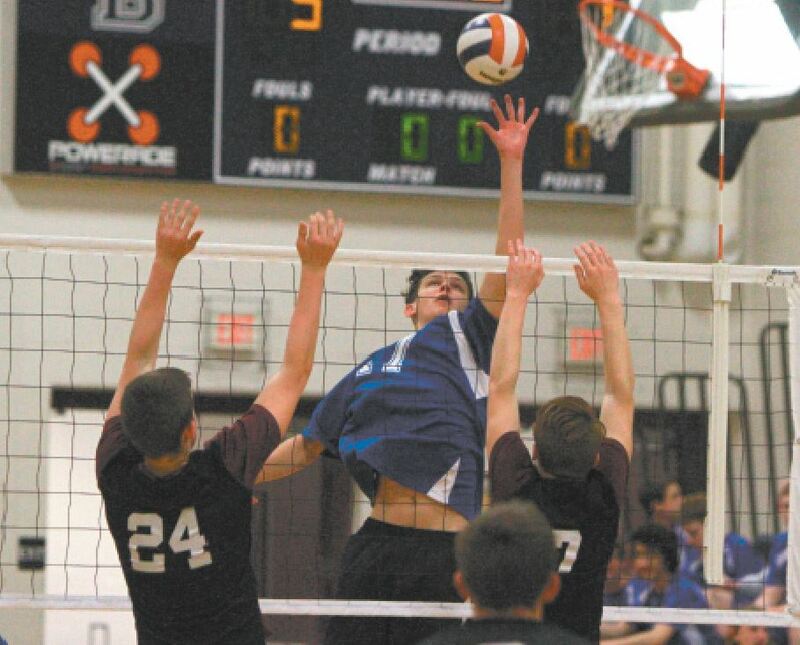 Scott Van Coughnett orchestrated the offense with 29 assists, while Nick Wood led the hitting with 13 kills. Vivek Nithipalan (nine digs) and Nathan Cole (three aces) were also instrumental to the win. The Cavs rallied to claim the final three sets in a 19-25, 22-25, 27-25, 25-13, 15-8 victory Monday. Nick Wood had a phenomenal game grounding 31 kills. Jonathan Brackett and Vivek Nithipalan had 12 digs each, while Scott Van Coughnett tossed up 51 assists. The Cavaliers totaled 52 points May 2 to finish fifth in the Sanborn Invitational, won by ConVal (178.5), followed by Sanborn (124.5), Goffstown (96), and Epping (61). Finishing behind the Cavs were Newmarket (43), Pembroke (38) and Raymond (9). Winners for HB included Kris Johnson in the long jump (20-4) and Sam Poisson in the javelin (150-3). Patrick Bloniasz was second in the 400. The Cavs at 96.5 finished behind first-place Sanborn (112) and second-place ConVal (108.5) in the Sanborn Invitational. They were ahead of Newmarket (95), Pembroke (69), Goffstown and Raymond (tied at 46) and Epping (7). Winners for HB included Madilyn Partridge in the 800 (2:37.96) and 1600 (5:41.75). Rachel Flanagan had seconds in the 400 and high jump. The Cavaliers enjoyed a walkoff in the bottom of the seventh May 3 when Nate Corsetti squeezed home Kaito Kramarczyk, who got the win in relief of Joe Brown. Brown pitched five innings allowing one run. Kramarczyk struck out four in two innings of relief. Tyler MacDormand had two hits for the Cavaliers. The Cavaliers lost in a walkoff Monday, as they had a two-run lead in the seventh inning and lost on a two-out single. Starting pitcher Kaito Kramarczyk took the complete game loss, only giving up six hits. At the plate Nate Corsetti had three hits, while Dan Leone and Nick Fothergill had two hits each for the Cavaliers. The Cavaliers (3-4) offense became alive May 2 to support the winning pitching of Gabby Paquin. The Cavaliers lost a heartbreaker in a game that saw 39 total runs on May 3. Starting pitcher Cassidy Pigott threw a complete game, striking out four and walking three, while going 3 for 5 at the plate, knocking in three runs. The Cavaliers lost in a back-and-forth game against Bow on Monday. Gabby Paquin and Cassidy Pigott saw time in the circle for the Cavs. Delayni Kovalchek had a single, home run and five RBIs to lead the Hollis Brookline offense. Will Crosby scored four goals and Derek Davidson added three Saturday as the Cavaliers rolled past the Tomahawk . HB spread out the scoring and received solid contributions from its younger players, as freshman Sander Wimmer tallied two assists. The Cavs got three goals and two assists by Cece Fetter on May 1, while Regan Berry and Tasha White each had two goals. Grace Santoski had 10 saves in goal. The Cavaliers had a great performance on the court May 3 losing only one match on the day. Winning in singles were No. 1 Nic Vahe (8-1), No. 2 David Cherkassky (8-3), No. 3 Darius Paradie (6-1), No. 4 Cam Vahe (8-5), and No. 6 Ben Zielinski (9-8). Sweeping the doubles action were the teams of No. 1 Matt Williamson-Zielinski (8-6), No. 2 Sam Hall-Eli Rasmussen (8-3), and No.3 Max Burns-Sreekar Chilalsapati (8-3). The Cavaliers nailed down another win May 3 as singles winners included No.1 Courtney Koran (8-4), No. 2 Maddy McCann (8-5), No. 3 Emily Spooner (8-2), No. 5 Holand Traver (8-2), and No.6 Sam Randlett (8-3). In doubles wins, No. 1 Koran-McCann (8-4), No. 2 Spooner-Julia Stam (8-6), and No. 3 Traver-Randlett (8-6). The Cavaliers had a tough day, losing their second match of the season. Holland Traver had the closest singles match, losing 8-5, as did all three doubles teams. The Cavalierswon four at singles and two at doubles to beat the Sabers on May 5. HB winners included No. 1 Courtney Koran (8-1), No. 2 Maddy McCann (8-1), No. 4 Julia Stam (9-7) and No. 6 Sam Randlett (8-6) in singles, and No. 1 Koran-Randlett (8-3) and No. 3 Traver-Randlet (9-8, 7-5) in doubles. Winning for Souhegan were No. 3 Lila Morgan (8-2) and No. 5 Zoe Garvey (8-5) in singles, while Sophia Knight and Eliza Cullen won 8-1 at No. 2 doubles.